406 H Street NE, Here we come! DC will now have two places to satisfy their sweet tooth and satiate their savory cravings! Sticky Fingers Bakery Bistro has officially signed a lease on a space that will allow us to spread our wings and take this to the next level. Bread, pies, seated service, a bar! Read the Washington Posts announcement on what we have in store! After months and months of dedicated scientific research, we've finally created a Fancy Cakes menu. Quantitatively created to meet your craving and celebration needs! Birthday's, showers, graduations and more, we've got you covered for your next event. Pumpkin Whoopie Pies and Go Veggie! 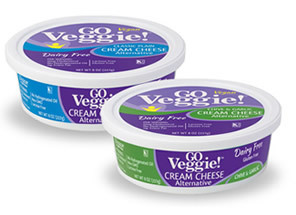 This vegan cream cheese has a great taste and a wonderfully creamy texture. 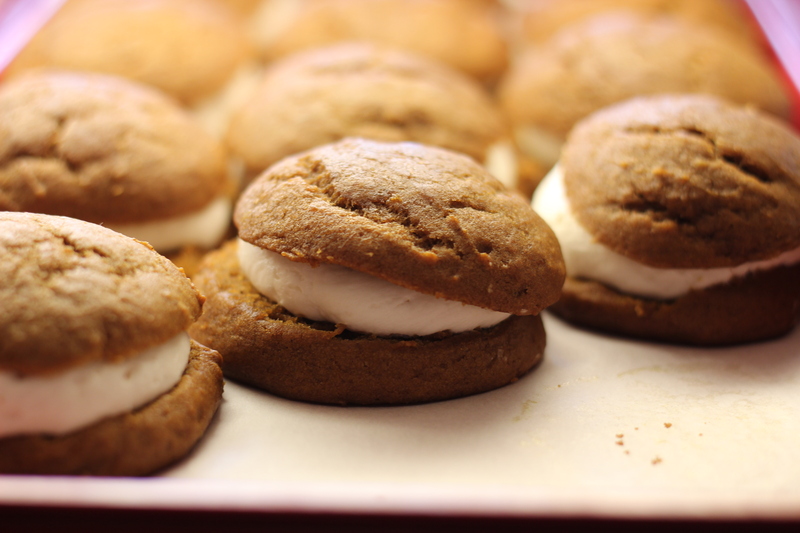 Try it out in our Pumpkin Whoopie Pies (*recipe below). What are you waiting for? Go claim your coupon and get cooking. If you want more from GO Veggie!, including the inside scoop on new products like their new dairy free and vegan shreds and slices (!!!) be sure to like them on Facebook, and follow them on Twitter. Enjoy! "Sticky Fingers Sweets; 100 Super Secret Recipes"
2. Line two baking sheets with parchment paper; set aside. 3. In a large bowl, whisk together flour, salt, baking powder, baking soda, cinnamon, ginger, cloves, nutmeg and allspice. 4. In the bowl of a stand mixer, mix together brown sugar and oil with the paddle attachment until well combined. 5. Add pumpkin puree and mix until combined. 6. In a small bowl, whisk together the egg replacer and water. 7. Add egg replacer and vanilla to the pumpkin mixture and mix until well combined. 8. Add the flour mixture to the pumpkin mixture, about a cup at a time, and mix until fully incorporated. 9. Using a small ice cream scoop with a release mechanism, drop heaping tablespoons of dough onto prepared baking sheets, about 1 inch apart. 10. Transfer to oven and bake until cookies are just starting to crack on top and a toothpick inserted into the center of each cookie comes out clean, about 15 minutes. Let cool completely on pan. 1. In the bowl of an electric mixer fitted with the paddle attachment, beat the shortening until smooth. 2. Add cream cheese and beat until well combined. To assemble: Transfer filling to a pastry bag. When cookies have cooled completely, pipe a large dollop of filling on the flat side of half of the cookies. Top with the remaining cookies, pressing down slightly so that the filling spreads to the edge of the cookies.